Long sleeves T-Shirt made from 100% Ultra cotton. “Apache Powerboats” 3 inch logo silk screened on the front left chest area and large 10 inch “Apache Powerboats” logo silk screened on the back. 6.1 ounces. Long sleeved T-Shirt made from 100% Ultra cotton. 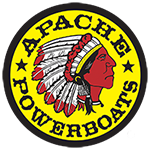 “Apache Powerboats” 3 inch logo silk screened on the front left chest area and large 10 inch “Apache Powerboats” logo silk screened on the back. 6.1 ounces.